These days, with dairy out of my diet, finding sweets that are both dairy-free AND delicious hasn’t been an easy feat. Of course, I’ve done my research and have found a number of great options. Not only for myself to add to my wishlist, but for you to indulge in – or add to your list too! 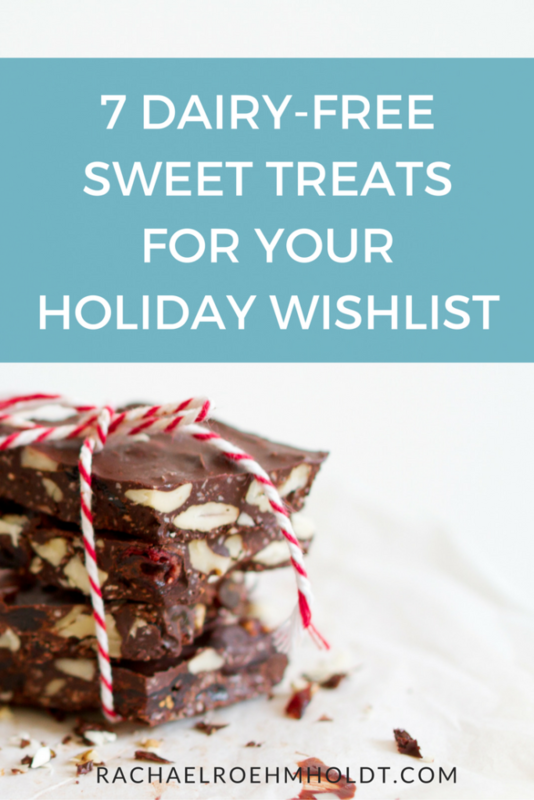 I’ve rounded up 7 seriously yummy, dairy-free sweet treats for you to try this holiday season. Whether you’re filling a stocking or stashing it away in the pantry for a later day, these concoctions won’t have you missing the dairy one bit! Vosges Super Dark Super Foods + Dark Chocolate. They feature Coconut Ash & Banana, Matcha Green Tea, and Guajillo & Chipotle Chili. I can vouch for these they are AMAZING. Probably some of the best chocolate I’ve ever tasted is from Vosges. Amore di Mona Luxury Dark Chocolate and Caramela Box. Three bars in one gift box including dark chocolate, caramela, and caramela with cherries. Yum! Green & Black’s Organic Dark Miniature Bars Collection. Inside this gift set are 12 dark chocolate bars in a variety of flavors to taste test and choose your favorites. Cocomels Coconut Milk Caramels variety pack. These don’t come with fancy packaging, but I taste-tested these recently (hey, I was doing my research!) and was in love with how genuine to caramel they tasted without having any dairy. If you have a caramel lover in your life, these are going to be a big hit – whether they can eat dairy or not! Premium Chocolatiers Chocolate Truffle Collection. If you want to enjoy fancy chocolates with fancy packaging, these are a great option. Justin’s Organic Dark Chocolate Peanut Butter Cups. Again, buying this isn’t for the person who wants a fancy gift. But they’ll love you forever when they try these. These are the BEST dairy-free peanut butter cups I’ve tried – and I hate to admit, they are seriously my kryptonite. Dang Toasted Coconut Chips in Caramel Sea Salt. These are a unique treat. I’d never tried toasted coconut chips before and they are divine. I actually found them at Target and thought they were really delicious. These would be a yummy stocking stuffer idea! P.S. If you loved this roundup, be sure to pin it on Pinterest to share the love!